After four days of dark day cloudiness (exciting storm-watch fun days) the sun set on the Pacific last night switching on golden beauty. 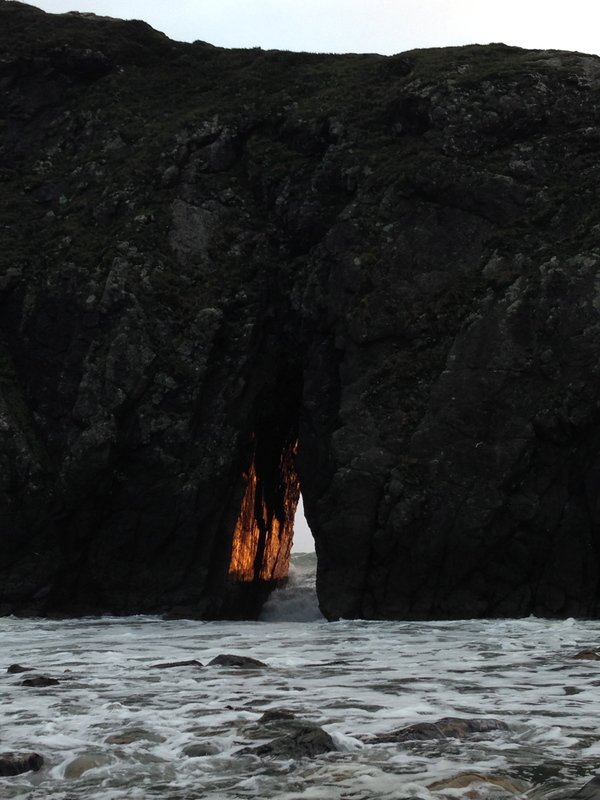 This shot of a 100 ft tall haystack off Harris Beach State Park provided an incredible burst of orange sunburst through a wave-worn notch at its base. 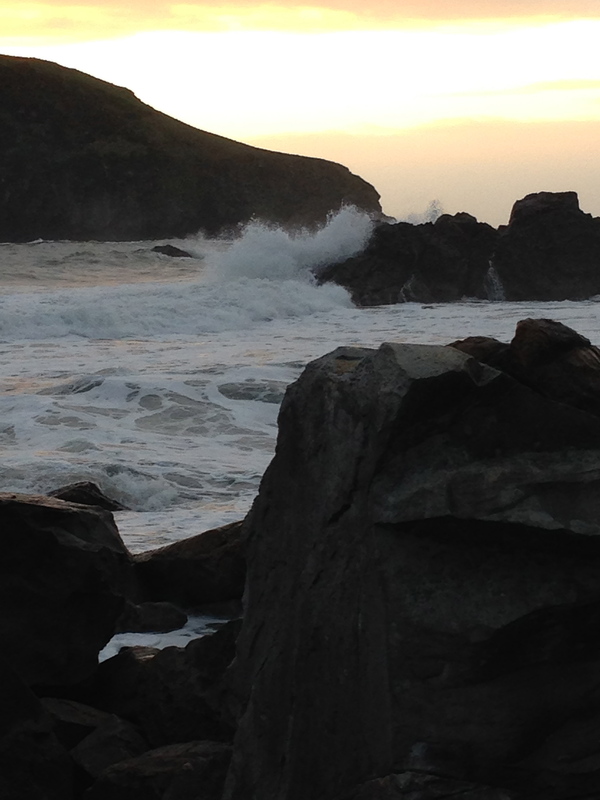 Without gale force winds and sideways rain we suddenly couldn’t wait to explore our beach. For the first time we took the short hike from our campsite down the trail to the nearby “marine gardens” area. There are no words for what we encountered. The surf report says today andThursday could be just the conditions we have hoped for. With daytime highs at 60 degrees we are ready for an all day adventure with sand and/or waves underfoot. The last stormy day did not disappoint. 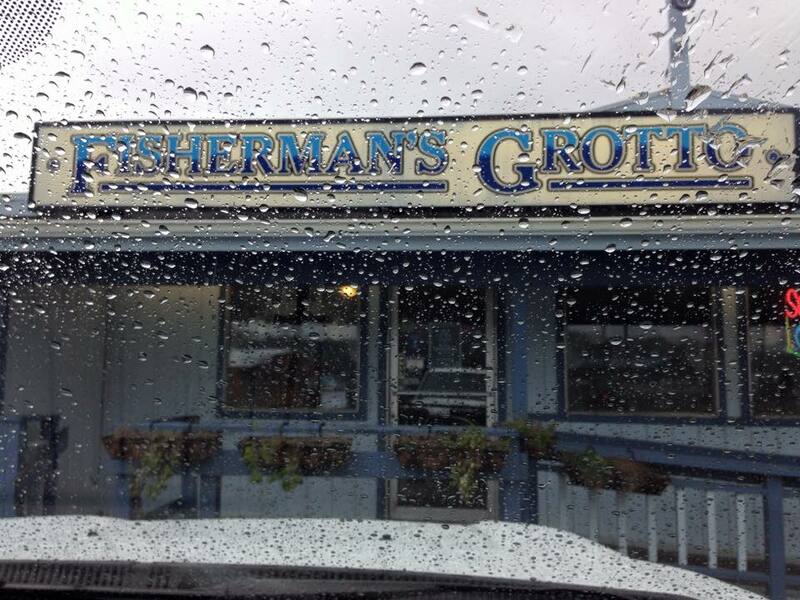 If you are in the Coos Bay area, be sure to fuel up with fish and chips at Fisherman’s Grotto. We ran into a Simpson local (his great grandfather was part of the original group to settle Charleston) full of stories. No matter who came in, conversation bubbled from table to table – and the fish ‘n chips were crisp and delicious. 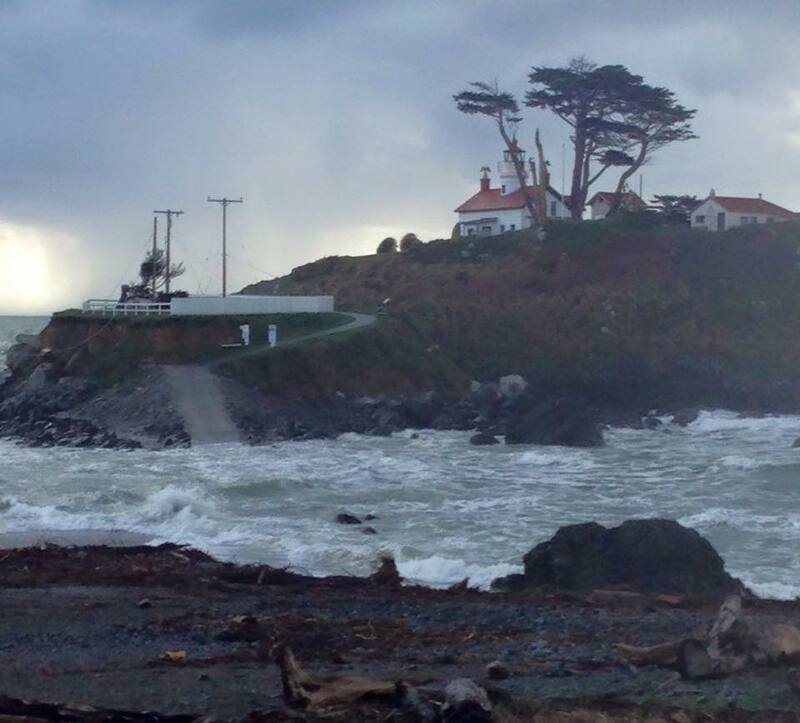 Our next stop was Shore Acres Park where we hung onto the viewing rail a hundred feet above the raging sea smashing sky high wave bursts. If the frigid wind didn’t chill us to the bone we would have stayed for hours. Tide pools, rock formations, cliff views and trekking – this winter SUP trip is delivering beyond expectation. It’s our third night out on the “Great Winter SUP Trip” and the wind keeps cranking into the 30-40 mph range, although the time between rainstorms is getting longer. The trip is the epitome of making the best of what the weather delivers. We have yet to see a single surfer or paddler out in the water. So we bundled in to the car and headed out. 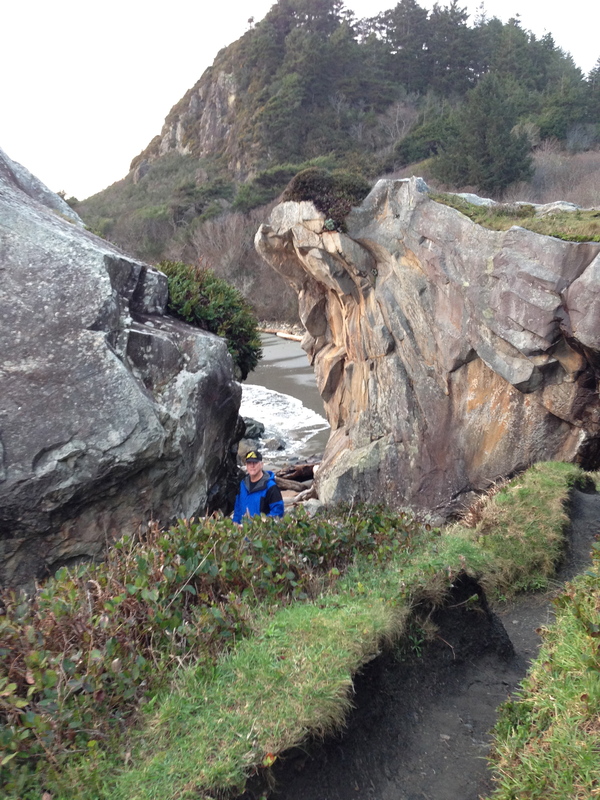 We explored from Brookings, OR to Orick, CA in the Redwood National and State Parks today. 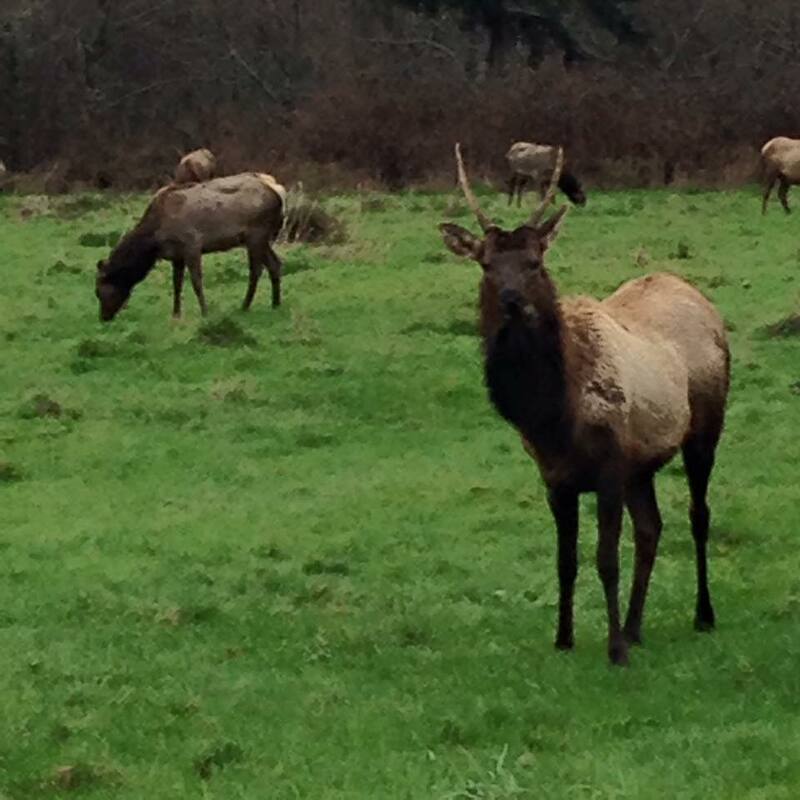 We dodged rain, a herd of elk (safe distance), fallen trees and shoreline salt spray. 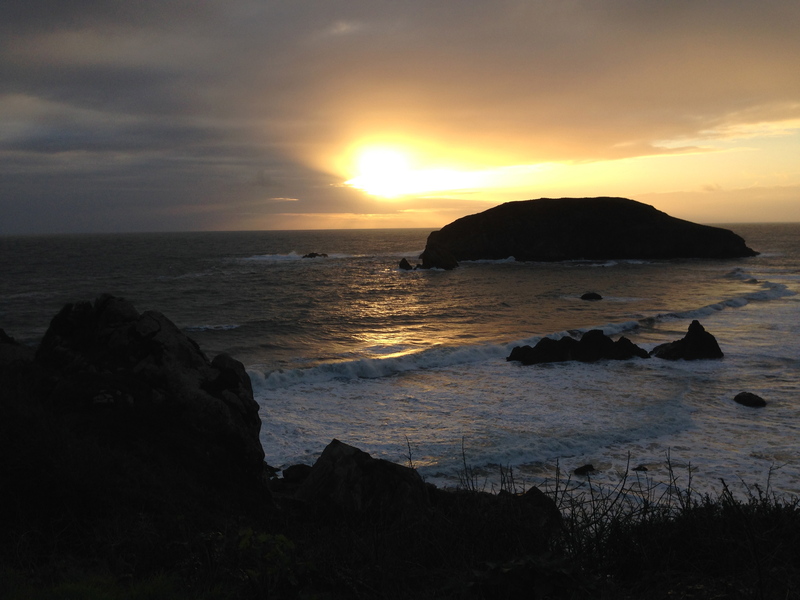 As dusk approached we bundled up for a hike on the Lookout Trail above Harris Beach State Park for some peek-a-boos of sun – YAY. 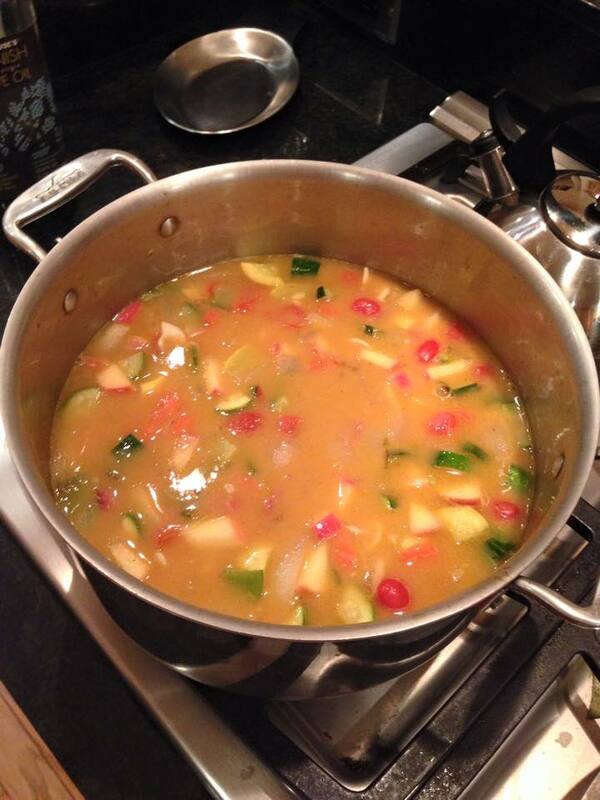 As dinner time approached it just seemed like a night for soup. Luckily, a few weeks ago I had made a number of crudite’ trays with lots of leftovers. I sauteed all of it – carrots, zucchini, snow peas, cherry tomatoes, even some cucumber with onion in a little olive oil. Simmering it all in vegetable broth smelled good but did not have the robust flavor I wanted. Looking around I spotted about 8 oz of leftover hummus and about 2 oz of Manchego cheese. Soon it was all simmering and mingling flavors. That frozen goodness became our dinner – with a fresh green salad and garlic bread. 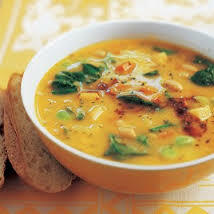 Here’s the hummus recipe – what a delicious addition to a vegetable soup. Scant 1/4 cup olive oil – only as much as is needed to create the texture you like. Directions: Place the chickpeas, garlic, and kosher salt in the bowl of a food processor. Process for 15 to 20 seconds. Stop, scrape down the sides of the bowl, and process for another 15 to 20 seconds. Add the lemon juice and water. Process for 20 seconds. Add the tahini. Process for 20 seconds, then scrape down the sides of the bowl. With the processor running, drizzle in the olive oil and about 8 dashes of hot sauce. 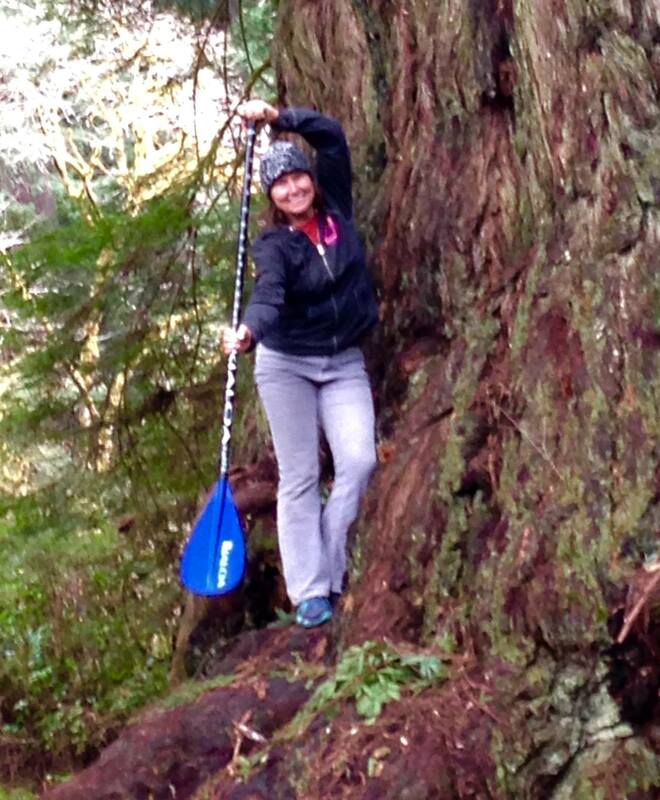 Apparently we were the first standup paddlers they had seen in the sound. 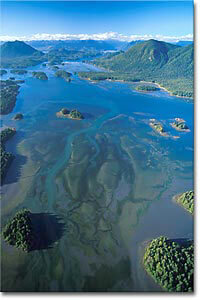 Boating and paddling in the waters of Clayquot Sound is one of the most rewarding ways to experience this environment. We thought it pretty cool that we were the first to experience it from the SUP perspective. As with any first ascent, or first crossing, one needs to be acutely aware of the local environment. In the case of Clayquot Sound the tides and current pack so much power that it could have been a dangerous undertaking to meander around the various islands and inlets. Of course we had flotation devices and leashes, but more importantly we embarked on the first crossing with a full awareness of when slack tide and low tides would occur. We studied, spoke to locals and planned our SUP time carefully. The currents in the sound are fierce. We watched a few unsuspecting kayakers magically move backwards despite a strong forward paddle stroke. If you’re inexperienced with ocean currents, it’s best to get a few pointers from folks at the local kayak shop or harbor. We were intently watching a bald eagle fishing nearby when a large swirl of conflicting currents loomed ahead. The swirl was easily 60 feet across and rose several inches above the water’s surface. We got on our knees and really had to work to stay upright and move through the obstacle to calmer waters. Noting the time, we realized that slack tide was ending and the consistent schedule of the lowering tide was about to begin. This was not a time to wander off our course or toward the channel that opened out to sea. In the photo to the left you can see how close the village of Tofino is to the open ocean (lower left). Another interesting local feature to be aware of is the seaplanes regularly landing in the sound. They land in an area shown (center of picture at left) that is close to our put in and take out point at the harbor. Coincidentally, there is a relatively shallow bank that stretched about 200 yards across in the same area. Just when your path is taking you across the shallow bank and its squirrely currents, you are in the path of the approaching seaplanes. It’s easy to be safe – as long as you stay aware of the surroundings both natural and man-made. 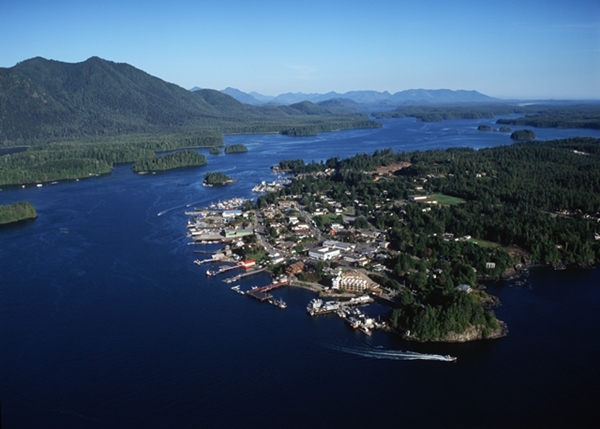 The Tla-o-qui-aht First Nation is a Nuu-chah-nulth Nation with territory along the west coast of Vancouver Island in Clayoquot Sound and much of the Pacific Rim National Park. 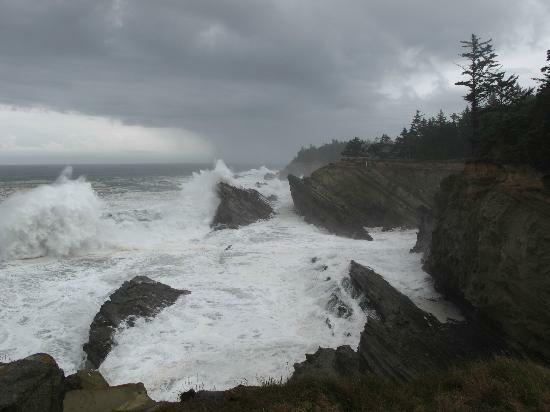 There are communities both at their Opitsat Reserve noth of Tofino in Clayoquot Sound and at Esowista inside Pacific Rim Park. The warm, south-facing beach on Meares Island makes an ideal village site. Opitsaht has been inhabited by the Tla-o-qui-aht and Ahousaht First Nations for thousands of years. Today, Opitsaht is one of two main villages of the Tla-o-qui-aht people. The village is only accessible by water. Children from Opitsaht travel on a school boat to attend elementary school in Tofino or high school in Ucluelet. It was close to sunset when we rounded the nearby island and Opitsaht came into view. A group of men were unloading the day’s catch on the dock as they curiously watched us paddle by. We acknowledged each other with a nod and exchanged smiles, then they went back to work. The traditions of their culture are as connected to the sea as the traditions of standup paddling. It was a great first crossing and one we hope you can experience some day. If you have completed a first crossing of a lake, bay, river section or sound, share your story with us. A few hours in a new place can be lots more enjoyable when some “local knowledge” is shared. E-mail us or COMMENT with a link to your blog or website.